Ok, I know I say this often but I swear this time it’s true – Simon Kenyon has THE BEST job in the world! 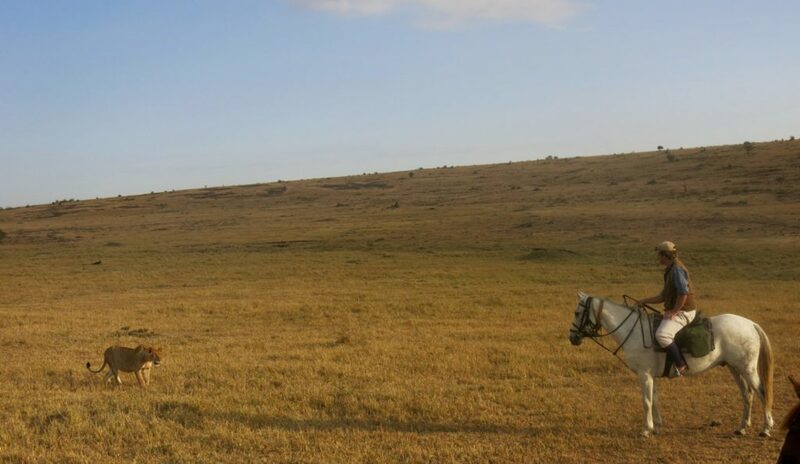 He is a head guide on our horse riding holiday in Kenya’s great Maasai Mara, and gets to gallop with zebra and wildebeest, wander with giraffes, and keep a watchful eye on those majestic lions each and every single day. Jealous much? I know I am! Born and raised in Kenya, his knowledge and enthusiasm for his home country is infections and provides a uniquely special experience for his guests. Here we find out more about Simon and his envious lifestyle! How long have you been guiding in Kenya? I have been guiding safaris all over Kenya for the last 10 years. I started as a backup guide to Tristan Voorspuy and soon started to lead the riding safaris. For the last 5 years I’ve been the head guide and lodge manager at Sosian Lodge in Laikipia and have been leading rides in the Mara and throughout Laikipia. What was the background, history or reason for becoming a guide here? I was born and raised on a farm in Laikipia near Mount Kenya so I grew up here and love my country. I went to school in the UK and graduated with a degree in Zoology from the University of Leeds. I also spent some time as a guide in Argentina and Botswana, but knew I would eventually make my way back to Kenya, it’s my home and I love sharing it with people. Meeting new people and showing off the delights of Africa’s wildlife from the back of a horse. The wildlife in the Mara is amazing, undoubtedly the BEST game on the planet. Prepare yourself for an adventure of great excitement!